Chlorophyll, blood, and vitamin B12 are all based on the porphyrin molecule. But porphyrin can also be used as an electrode material where it speeds up the charging process of rechargeable batteries. In the Angewandte Chemie International Edition journal, researchers from KIT now present the new material system that could mark the beginning of an era of high-performance energy storage and supercapacitors. Currently, the most widely used battery technology is based on lithium ions. No other rechargeable storage device for electric energy has comparable application properties. Thus, lithium ion batteries are currently indispensable for devices such as laptops, smartphones, or cameras, even though improved properties such as quick-charging would be desirable. Many materials that improve the properties of lithium ion batteries in the lab, however, are no sustainable options because they are rare, expensive, toxic or harmful to the environment. Ideally, high-performance energy storage materials would be based on renewable resources. An interdisciplinary research group headed by Professor Maximilian Fichtner of Helmholtz Institute Ulm, founded and organized by KIT, and Professor Mario Ruben from the KIT Institute of Nanotechnology, now presents a new energy storage material that allows a very fast and reversible inclusion of lithium ions. For this purpose, functional groups were added to the organic copper porphyrin molecule that produce structural and electro-conductive crosslinking of the material when the battery cell is charged for the first time. This significantly stabilizes the structure of the electrode in lab tests and allows several thousands of charge-discharge cycles. With this material, storage capacities of 130-170 milliamp-hours per gram (mAh/g) were measured in the lab – at a medium voltage of 3 Volt – and charging-discharging times of only one minute. Current experiments suggest that the storage capacity can be increased by another 100 mAh/g and that the storage system can be operated not only with lithium, but also with the much more abundant sodium. "Porphyrins occur very often in nature and are the basic constituents of chlorophyll, of human and animal blood pigment (hemoglobin), and of vitamin B12," Fichtner explains. Technical variants of these materials are already in use, e.g. for blue-colored toner in laser printers or for car paint. 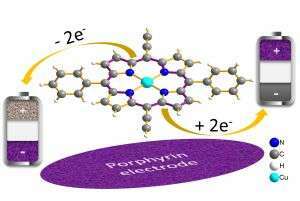 By bonding functional groups to porphyrin, the scientists succeeded to leverage its specific properties in electrochemical electric storage systems for the first time. "The storage properties are exceptional because the material has the storage capacity of a battery, but works as fast as a supercapacitor," Fichtner says.